After this last summer and the total disaster in Fort McMurray, I started thinking about what we would do if we met with a disaster in the motorhome – like a devastating fire – and we have seen this happen. We have seen a completely burned out class C sitting on the side of the road – it was frightening. 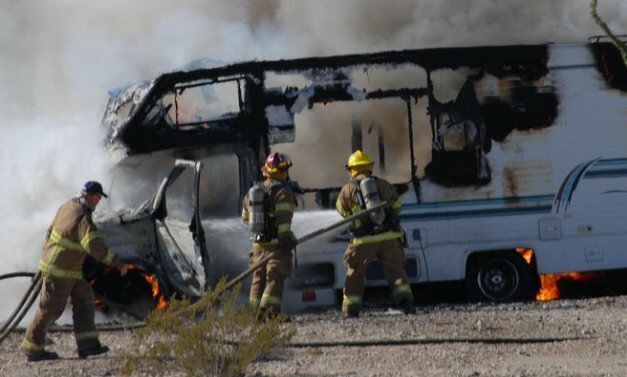 A fire can consume an RV in minutes. envelope in the freezer of your refrigerator. They said the freezer is the best place in an RV to protect your information in case of a fire. Others have suggested a bailout bag. Basically, we are talking about information and things you cannot live without – in a container that is easily accessible and that you can grab in a hurry. What would you put in the bailout bag? Each of us has our own “list of essentials” and undoubtedly, mine would be different from yours. I include copies of insurance policies, registrations, driver’s licenses, passports, important medical information, emergency phone numbers, emergency credit card, critical medicines and keys for vehicles and compartments. We do put a lot of the information on a USB flash drive that fits nicely in the bag. Other useful items could include a small LED flashlight, bottle of water, energy bar, plastic ponchos and maybe a signal mirror if you are in an isolated area. Where would you put the bailout bag? Or bags . . . most of us travel in two separate vehicles. We have more than two bailout bags: one in the toad and two in the motorhome (one near the exit door and one in the bedroom). In a trailer, there needs to be one bailout bag in the truck and even two in the trailer (one near the door and one near the emergency exit in the bedroom). 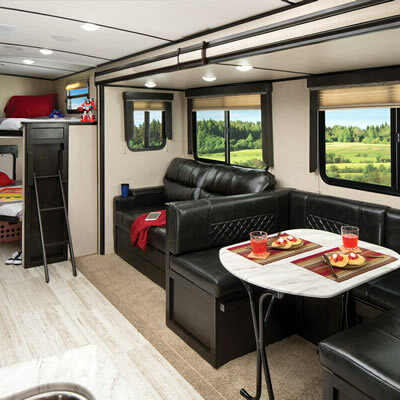 Regardless of what you think you can do or grab on your way out, RVers who have actually gone through a fire have stated there is barely enough time to get yourself out. In an emergency, your bailout bags need to be easy to grab either day or night. Smoke alarms: Generally, the fire detectors that come in RVs don’t detect smouldering wires (a major cause of RV fires). The smoke alarms may need to be replaced with ones that do. Fire extinguisher care: you have to tap the bottom of your extinguisher to keep it active and afterward you need to bounce it on the floor to settle it and get a true reading…just because the gauge reads okay doesn’t really mean that it is. Check your fire extinguisher monthly. Panic alarm: in case you need help, keep a set of your keys next to your bed so you can beep the horn and attract attention. Pets: The best behaved creatures can panic or hide in case of a fire making rescue impossible. Some RVers recommend a carrying case, but at least try to keep the animal leashed to control movement. Fortunately, we have never had to use our bailout bags but it sure gets you thinking. Casa Grande was our first stop in Arizona. One of the fascinating things about RV travelling is that you continually find other RVers you have met along the way. Here is a checklist for those things that often get overlooked when travelling south.